Learn how to facilitate a community discussion to engage and bring together the many voices of the community. What is a "dialogue" and why should your community host one? Where can a dialogue occur? Who can participate or host the dialogue? How do you host a dialogue? How do you make your dialogue count? Growing a healthy community is a lifelong process -- one that requires constant nurturing and persistence. Everyone has a role to play in building a healthier, more vibrant community. The choices we make at home, work, school, play, and worship determine most what creates personal health and community vitality. To a great extent it's about how we spend our time, dollars, and talents. But it's also about how we create the settings in our communities that help bring positive change. Healthy communities call for inspired leadership and action from every corner of our communities. Today, there's often a gulf between the conversations people have around the kitchen table and the conversations we have with our leaders. We see turf battles and fragmentation of efforts with more resources getting spent on the symptoms of deeper problems, and less on what generates health in the first place. This section is about bringing together the voices and talents of communities. The information is intended to help generate ideas and relationships across lines that divide us. It is for community leaders of all types -- anyone who can start a conversation -- and offers a flexible approach that can be adapted to any group's objectives. A "dialogue" is a community conversation that can take many forms. It can involve five people around a kitchen table, five hundred people in a large civic setting, or anything in between. Every citizen has a role to play in building community and creating health. The vitality of our communities and democracy relies upon the active participation of every person. Anyone can participate in a dialogue. Seek diversity! Reach across lines of race, culture, class, and locale to gather participants. What makes healthy people? Health is more than the absence of disease. It is an optimum state of well-being: mental, physical, emotional, and spiritual. Health is wholeness. It includes a sense of belonging to community and experiencing control over your life. Optimal health is a by-product of people realizing their potential and living in a community that works. "Community" can be everything from a neighborhood to a metropolitan region. It can be the workplace or a group of shared interests and faith. In the end, our "community" is where we are and who we are with. What makes a healthy community? It's a place that is continually creating and improving its physical and social environments, and expanding the community resources that enable people to support each other in performing all the functions of life and in developing themselves to their maximum potential. There is no one best way to host a dialogue. It depends upon what you want to accomplish. Tailor an approach that works best for your objectives, setting, participants, time, and capacity. The following six scenarios are examples of the some types of dialogues. This group's goal may be to focus and deepen their current work on health and quality -of-life issues. Or it may be to attract new and more diverse participants. They may want to reflect on and highlight learning or bring media attention to their efforts. A youth group at school or in a club setting. This group might want to make sense of their community dynamics or address the pressures and support they find in the community. They may want to identify key issues and become active on something important to them and their future. A church, mosque, or synagogue group. Faith leaders may want to engage the congregation in service to the neighborhood on a key issue. They may want to increase membership by taking action in the community. You might just want to invite a few neighbors over to enhance neighborhood cohesion or talk about a few rough issues. It could help build bridges across lines of race and class to work on something collaborative. A membership organization or service club (i.e. Chamber of Commerce, United Way, Lions, Rotary, neighborhood association, civil rights organization). An intact organization or group may want to identify opportunities for stimulating positive change in the community at a regularly scheduled meeting. Maybe it's time to consider what's making leadership difficult on a key issue facing the community. At the college or university. Students, faculty, administrators, staff, and community residents get together to listen and learn from each other and discover some possible ways to work together. Preparation will assist you in making your dialogue count. In the end it can help your group develop, focus, and act on the issues that are identified. It can take from two to five weeks to prepare for and complete a dialogue. A dialogue can last from one to three hours with anywhere from five to 500 people. It depends upon you scope and capacity. The following steps will help you prepare for your community dialogue. Of course, you should feel free to modify the steps to fit your purpose, group, and circumstances. 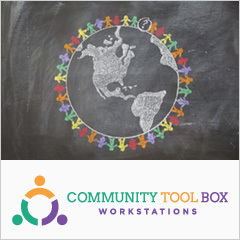 Check Related Topics on the Community Tool Box at the end of this section. Build a Dialogue Team to host the event. A team approach to convening a dialogue will help to build ownership and spread the tasks involved. The team can help you to define goals for the project. Identify a few people that you have worked with before and have credibility with -- and invite them to the dialogue. Determine your own goals for the dialogue. Your community may have some specific goals for the dialogue itself and the information received from it. The design of the dialogue session should reflect this. Your community might want to deepen existing work in the community or reflect on lessons learned. Your community may also want to start a new group to address community issues. Be creative in your design to ensure an unobtrusive blending with other local activity. Determine the group of participants. Who would you like to bring together to share ideas and opinions? To minimize the effort required for recruitment, you may find it easiest to partner with an existing group. This will allow you to use their network. You may also wish to bring in new voices to your group. Dialogue groups may be as small as five people or as large as 500 - it's just a matter of how your dialogue is designed, what you want to accomplish, and how much time you have. Most groups will include from 12 to 30 participants and last an hour and a half. Select and prepare your facilitator. Good facilitation is critical to a successful dialogue. You should enlist an experienced facilitator or someone who is a good listener and can inspire conversation while remaining neutral. Attributes of a good facilitator can be found on our website. It is important for the facilitator to get comfortable with the Dialogue questions and determine how to best design the conversation. Set a place, date, and time for your dialogue. Choose a spot that is comfortable and accessible. Dialogues can be conveniently held in someone's home, a community center, place of worship, library, or private dining room of a local restaurant. Hospitals, schools, and businesses often have conference rooms or cafeterias where groups can meet. Keeping sites convenient to the participants is key. Determine the time period (from 1-3 hours). Be sure to give a minimum of two weeks' notice of your dialogue meeting. A reminder call 2 days before the event will help to increase attendance. Create an inviting environment. Seating arrangements are important in a smaller group. To assure strong interaction, place seats in a circle or in a "U" formation. Refreshments (or food for a breakfast or lunch meeting) are a welcome and appropriate sign of appreciation but are not absolutely necessary. Many times, local businesses are willing to donate refreshments for community meetings. People are naturally attracted to people who speak from commitment and possibility. Trust yourself! People want to talk about what's possible in their communities. This is not like pulling teeth. Determine how to access your desired participants. Contact friends, co-workers, or specific community groups. Personal contact makes the difference! A telephone call with a follow-up letter or flier with the details is usually very effective. Don't worry if someone says no. Remember, if you wish to have a specific number of people in your group, you may need to recruit 1 1/2 to 2 times as many. If you want a large group that involves many community constituencies, it may be wise to advertise the dialogue in newsletters or fliers placed where people gather: in coffee shops, grocery stores, gyms, day care centers, places of worship, community centers, or libraries. Designate a person the Dialogue Team to take notes and summarize important points. The recorder doesn't need to keep a word-by-word account of the conversation, but should summarize the group's views during their interaction. It's just as important to note areas of disagreement as consensus. Obtaining quotations and stories from participants is essential. The facilitator should plan to sit down with the recorder immediately after the dialogue to review the notes and prepare a summary. Greet participants. It is important for the facilitator to greet participants as they arrive to develop rapport prior to the dialogue. This will help put guests at ease and encourage them to speak up. Introduction. The facilitator should introduce herself or himself and thank the participants for attending. A brief introduction, stating the purpose of the dialogue and the importance of asking the community for their opinions should follow. If the group is small, the facilitator may ask each participant to introduce herself or himself. Initiate the dialogue. These seven primary questions with a series of sub-questions are ideas to stimulate and guide the group 's conversation. Not all sub-questions need to be asked. You should tailor the dialogue to your community's needs. Each question has been researched to determine its reliability; however, slight adjustments may be needed. If the group is large, the facilitator may wish to project the questions on overhead transparencies for all to see. Engage the media and document the event. Some groups will want to have local media present to report on the dialogue and its findings. You may also want to take a few photos or video clips of the event. At the end of the dialogue, the facilitator can remind the group that simply taking the time to share ideas and personal values with fellow citizens is important. The group may consider some possible next steps but should not feel obliged to do something together. The group recorder may verbally summarize the dialogue and should then plan to send the notes to the participants. The group may be excited about a particular idea it would like to take action on and agree to meet again to develop some action plans. The group may decide to have a more in-depth conversation and involve some missing voices and perspectives from their neighborhood (or to involve their elected representatives and the local newspaper). The group may decide to have additional dialogues on other subjects of importance to them. The group may share information about existing community efforts that could benefit from volunteers and additional leadership. Facilitators may wish to direct interested members to learn about other successful community efforts around the nation. To make your findings count, record them and use them locally. Ensure that the results of your conversations advance local action by getting the results out to participants and relevant organizations within ten days of the dialogue. Follow up with the group on its interests. Ask each participant to share what has been learned and to keep the conversation going. Remember that each of us contributes to community well being simply by participating in civic dialogue. Growing a healthy community is a lifelong process requiring constant nurturing and persistence. Everyone has a role to play in building a healthier, more vibrant community. A healthy community is an imperfect place in an ever-changing state that builds a culture supporting healthy life choices and a high quality of life. Leadership and action should come from every corner of our communities to lessen the gulf between conversations we have at the kitchen table and those we have with our leaders. A community dialogue is aimed at bringing together the many voices and talents in our communities. A dialogue can take place in many kinds of places and forms from a group of five people in a home to five hundred in a public setting. Tailor your community dialogue so that it works for your objectives, setting, participants, time, and capacity. Make your findings count by recording and using them. Ensure that the results of your conversations advance local action by getting them out to participants and organizations within ten days of the dialogue. Follow up by asking participants to share what they learned -- this will keep the conversation going. David, D., & Larson C. (1994). Collaborative Leadership: How Citizens and Civic Leaders Can Make a Difference. Gadner, W., & Simon, S. (1993). On Leadership. Kellerman, B., & Matusak L. (1999). Cutting Edge: Leadership 2000 Editors. The Academy of Leadership Press at The University of Maryland. Norris, T., & Howell, L. (1999). Healthy people in healthy communities: A dialogue guide. Chicago, IL: Coalition for Healthier Cities and Communities. Ronald A. (1994). Leadership With No Easy Answers, Belknap Press of Harvard University Press.